South Koreans at the Seoul Railway Station on 9 May, 2018 watch on a screen reporting the visit of US Secretary of State Mike Pompeo, left, to meet North Korea Supreme Leader Kim Jong-un, right. What North Korea’s leader seeks from the international community is appeasement and not peace, let alone the freedom of his own people, a North Korean escapee says. “True peace will have to come alongside freedom of faith, belief, expression, speech for North Korean people,” said the former citizen of North Korea, who suffered torture at the hands of the regime of Supreme Leader Kim Jong-un before escaping. He now lives in the United Kingdom, and contributes to a blog for the Christian charity Open Doors International under the name John Choi. “The peace process has to prioritise the well-being of all 80 million Korean inhabitants,” Choi told World Watch Monitor, “with protecting the rights of people in North Korea as it must come alongside real freedom and human rights”. It is not the kind of peace, however, that interests Kim, Choi said. North Korea’s leader is not intending to release his control over the country but wants to model it after Vietnam, a communist country with a socialist economy. “He needs foreign investment, so he offers appeasement”, Choi said. Kim has put on a charm offensive to the world since January, he said, and the world has fallen for it, “making them think he is seeking real peace”. On 9 May US President Donald Trump announced that Kim had released three Americans of Korean descent, who had been held prisoner for between one and two years. “I appreciate Kim Jong-un for doing this,” said Trump, who is preparing to meet Kim at a time and place not yet officially announced. Choi takes the supreme leader’s overtures with a grain of salt. “I read in the Washington Post the other day the suggestion that we should forget that Kim Jung-un is a dictator, and we should from now on regard him an ‘international actor’. That was disappointing,” he said. Choi will be watching Trump for signs he means to hold North Korea accountable. North Korea is a perennial No. 1 on the World Watch List, a ranking of the countries where it is most difficult to live as a Christian, updated annually by Open Doors. 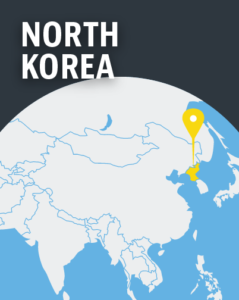 An Open Doors staff member closely involved with North Korea Christians told World Watch Monitor that there is plenty of reason to be cautious about Kim’s recent overtures, but that a growing number of Christians in the country is just one reason to be optimistic, too. “It’s very likely that sanctions – which seem to be working now – will be lifted. This is good for the general population, but also for the leaders. It helps them stay in power,” said the OD source, who asked not to be named because of the security concerns associated with work in North Korea. The comments by Choi echo the call of the UN Special Rapporteur on human rights in North Korea, Tomás Ojea Quintana, to Trump to put human rights on the table with Kim. “A denuclearisation deal will remain fragile if it sidelines the rights and needs of the DPRK population,” he said in a statement, using the abbreviation for North Korea’s formal name, the Democratic People’s Republic of Korea. He added that achieving peace and security is also dependent on securing people’s rights and freedoms. “The DPRK has proven to be a tough negotiator and not even mentioning human rights at this very first stage of negotiations would be a misstep and a lost opportunity,” Quintana said. North Korea said conclusions in the US State Department’s 2017 human rights report that called “the DPRK one of the most repressive and abusive regimes in the world” were “ridiculous” and “vicious slandering”. Church leaders in South Korea, meanwhile, welcomed the improvement in relations between their country and its northern neighbour, reported the Catholic news agency UCAN. The meeting between Kim and South Korea President Moon Jae-in “opened the way for peace and reunification through complete denuclearisation,” said Cardinal Andrew Soo-jung of Seoul. He said Christians have a role in helping “the two Koreas reunify”. North Korea forbids any form of religion other than worship of the country’s leader, according to Open Doors, which says Christians live in constant fear of being ‘found out’, for which punishment can be a prison sentence, torture and death. While it is also almost impossible for North Koreans to access any form of religious literature, a South Korean radio broadcaster is trying to reach them. The Far East Broadcasting Company transmits Christian programmes both to North and South Korea, with programming for North Korea carrying a focus on “defector-run shows about Christianity, and provides audio church services – the latter because most North Koreans cannot attend local churches, or even speak about Christianity, without risking forced labour or execution”, reports The Atlantic. However, there are reports, as yet unverified, that claim North Korea has asked the Baptist Charity Service in Hungary to build a church in the capital. The request reportedly comes from a senior officer in the North Korean Ministry of Foreign Affairs, who put it to the Charity Service’s director when he was preaching in North Korea’s only Protestant church, in Pyongyang. An Orthodox church is also reportedly being built, with Russian support.